Kuala Lumpur is our go-to place for Thai tourist visas, and the hub for our favourite airline – AirAsia. Therefore, we spend a few days there quite regularly. And therefore, we have tended to take Kuala Lumpur for granted a little. We’re sorry, KL – it’s not you; it’s us. Sure, we watched the Twin Towers at sunset from the rooftop bar across City Central Park. We stay either in Chinatown or Little India, so the legendary Kuala Lumpur ethnic vibe is unavoidable. However, there is a lot we haven’t yet seen. 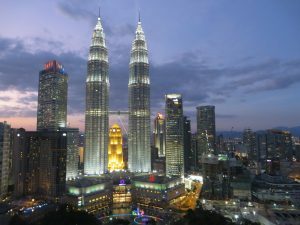 Rather than spend another few days on KL staring at laptops in our hotel room, we decided to tick off some of Kuala Lumpur’s low-cost tourist delights. 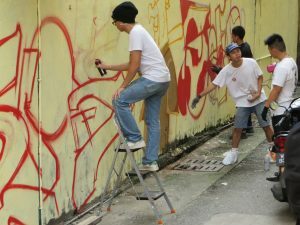 While Penang has made a name for itself with interesting street art, Kuala Lumpur is also no slouch in this art form. 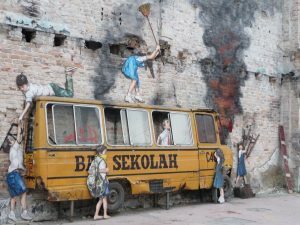 This clever installation features the actual side of a school bus, and is located in a car park off Jalan Sultan in Chinatown, one block west of the Petaling St flea market. In the laneway across the road, we caught some street artists at work. They had drawn quite a crowd of onlookers! It’s not quite clear to us whether this work is officially sanctioned (or even supported financially), or whether the artists are taking a legal risk by doing this. In the early stages of the work, it was not entirely clear what they were depicting. Fortunately, this laneway was conveniently located between out hotel and our favourite eating places, so we passed it every day. It’s amazing how fast street art comes together! We really enjoy finding quirky bits of street art in laneways and car parks around Kuala Lumpur. We stilt think he school bus is the best we have seen, though. 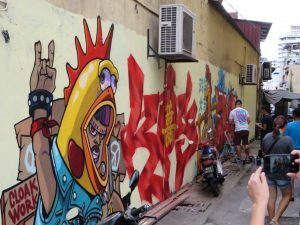 You don’t usually think of railway stations as tourist attractions, but Pasar Seni in Kuala Lumpur is one of the exceptions. Designed with classic Muslim Empire architectural features, the station resembles a mosque more than a public transport hub. 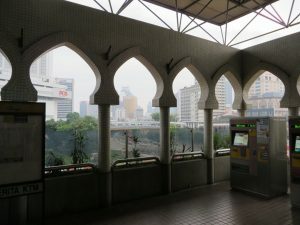 At Pasar Seni, there is a regular railway station, a light rail station, and a bus interchange. A big construction site beside the bus interchange will soon be a MRT station (a new type of rail transport being rolled out across the city). So, Pasar Seni is a big deal. 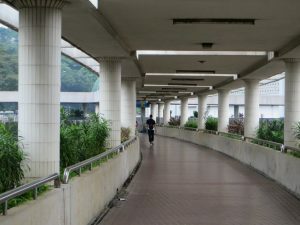 The railway station is connected with the light rail station on one side and a car parking building on the other side by walkways, which cross the (many) railway lines, two roads, a pipeline, and a canal. The overall effect is quite futuristic, especially in the cleaner parts. Looking down from the walkways gives an insight into the grimier aspects of the rail system. 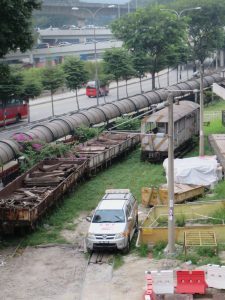 We weren’t sure if these were abandoned carriages, or even the remaining parts of carriages which had been cannibalised for parts. They seemed to have been here for quite some time. We walked around this area early in the morning, before the heat and humidity made walking unpleasant. This meant we saw the side of the city geared toward locals. Tourists tend to sleep in a bit longer. We always like to get a feel for what it would be like to live in a place, not just visit as a tourist, so we seek out these times. 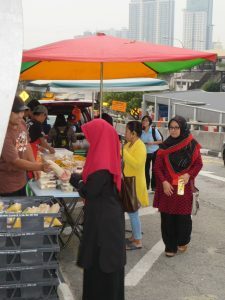 On the light rail side of the overpass, a few entrepreneurs had set up stalls selling breakfast foods out of the back of vehicles. The Malay version of breakfast food makes little concession to the hour of the day. Vendors offer spicy curries and heavy, deep-fried snacks – not a light, healthy choice in sight. 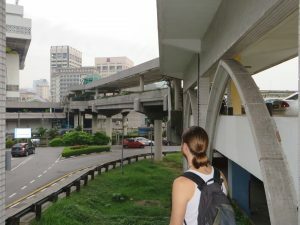 When we finally reached the far side of the railway station, having entered the complex via the bus interchange and light rail station, we tried to capture some sense of the overall size of the walkway structure. Frankly, it’s not something any picture can truly capture. 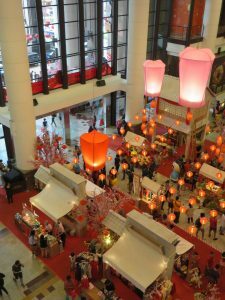 If you ever go to Kuala Lumpur, you’ll have to look for yourself! In this picture, the car park is to the right of Ravi, and behind it is the railway station. Following that walkway takes you across both roads, the pipeline, and the canal to the light rail station. Beyond the light rail station, and not visible from this angle, is the bus interchange. From this car park, there is just one (multi-lane) road to cross to reach the Masjid Negara, the National Mosque. For today, though, we were staying on this side of the road, to explore the park beside the car parking building. 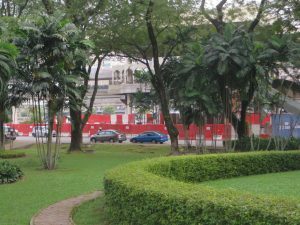 In this picture, you can see the corner of Pasar Seni railway station through the trees. The car park is to the left of this shot. Despite the early hour, there was someone napping on the grassy knoll. Given its location between two busy roads, and near a railway line, the park was surprisingly peaceful. The trees are well-established, and produce a lot of very welcome dense shade. 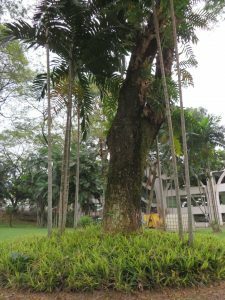 The grass, well-watered by tropical rain, is thick, green and lush. There would need to be someone mowing the grass just about every day in the warm, wet environment of Kuala Lumpur! After taking our fill of the shade and quiet, we checked out a small restaurants near the park. 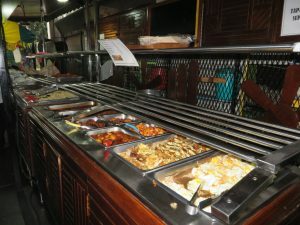 At eight in the morning, they had their full array of spicy curries and burning hot 2-minute-style noodles on display. Who can eat such things at eight in the morning? We also ordered two of the classic Malaysian “take away” drinks, which come in a plastic bag. Milo ais (iced Milo), of course. Making our way back over the walkways to our familiar stomping ground, we fetched up at Jenny’s favourite breakfast spot. 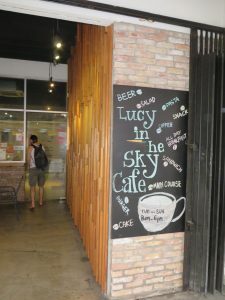 One of the few places in South-East Asia where the scrambled eggs are REAL scrambled eggs, Lucy in the Sky Cafe also boasts espresso coffee and some very delicious specialties. Eggs Benedict (with real smoked salmon if you are not a fanatical vegetarian), mushroom salad, fresh-squeezed juice, and some out-of-this-world cakes make Lucy one of our preferred work hang-outs when we get tired of working in our hotel room. And there is the redoubtable Constance. She not only recognises us when we come back after several months away, she also remembers our favourite orders! There are shopping centres, and there are SHOPPING CENTRES! Berjaya Times Square certainly warrants the capital letters. For a start, check out the lobby – it must be four storeys high! 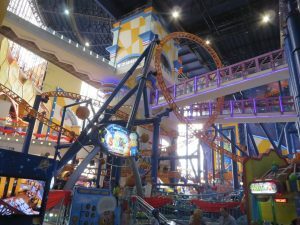 Apart from nine floors of retail, the centre includes a cinema, ten-pin bowling, and a theme park (inside the building) complete with a roller coaster! We bought mobile phone credit and some clothes, decided there wasn’t really a movie we wanted to see, and seriously considered riding the roller-coaster. Ravi wasn’t 100%, though, so we decided to wait till next time. Yes, that is a completely upside-down loop in the roller coaster, inside the shopping centre building! One day, we might stand on that walkway and video the roller coaster as it whips around us. Because the array of movies at the cinema didn’t tickle our fancy, we were forced to go to another shopping centre for our movie fix. 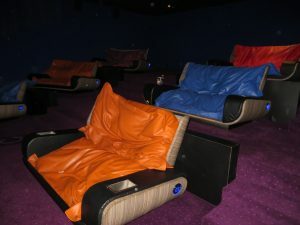 How do you like the idea of snuggling on a beanbag to watch a movie – in the cinema? One cinema chain has introduced Beanie Class cinemas (alongside standard, Premium and Gold class). They must be popular, because over the past few years they have rolled it out to most locations in Kuala Lumpur. 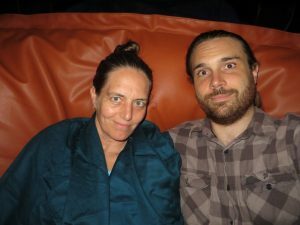 We went to the Beanie Class cinema in KLCC shopping centre, because it is an easy trip on the light rail from our home station of Pasar Seni. It was a unique enough experience that we took a rare phone selfie! Notice we are rugged up? Cinemas are air-conditioned to arctic temperatures in Malaysia, so take your extra layers when you go. And then it was time to head back to Koh Phangan. After nearly two months away, we were looking forward to getting back.